… by spreading the word. Email us for posters and fliers, or download a PDF of our A4 poster from this link, and either print it or pass it on electronically. Or pass on this link from concert-diary.com. Thanks for your help. Russian choir to perform in Rosyth! 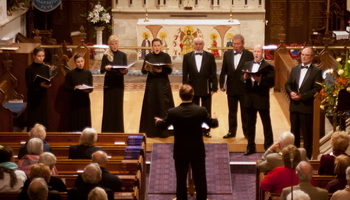 More than 400 years of sacred music will be brought to life at Rosyth Methodist Church this month as the acclaimed Voskresenije Choir arrives in Fife. Musical director Jurij Maruk will lead the ensemble in an evening of traditional Russian sacred and folk music at the Queensferry Road church on Wednesday 16 November at 7.30pm. Voskresenije, which means ‘resurrection’, was founded by Maruk in 1993 and is now one of the most respected ensembles on the sacred music circuit, winning widespread critical acclaim across Europe for its inimitable performances. In the first half of their programme the gifted vocalists, who all studied at the St Petersburg Music Conservatoire, will bring us some of the most inspirational and moving works in the Russian sacred music repertoire, spanning the 16th Century to the 20th Century, and including extracts from Rachmaninov’s 1916 Vespers. The second half will provide a complete contrast, with a selection of spectacular Russian folk songs, allowing us to enjoy the talents of individual performers, displaying, for example, the extraordinary range of basso-profundo notes that we associate with the world of Russian choral music. Tickets are priced £8, £6 concession, and £1 for school-children, and can now be reserved by calling or texting 07961 794864, or by emailing us. Please note that all tickets should be collected at the box office on the night, and paid for either in cash or by cheque payable to “Rosyth Methodist Church”. If booking for a group of people, please reserve the required number of tickets as soon as possible to avoid disappointment. Note that reserving a ticket will ensure you get a seat, but that the seats are not allocated, so come early. The main building and box office will be open from 6.30pm, and access to the seating area will be from 7.00pm onwards. The church has disabled access and toilets, but it would help our stewards to know in advance if you require a wheel-chair space. The Church is on the corner of Queensferry Road and Woodside Avenue. If coming by car, point your satnav at KY11 2JH, or use the map and directions at this link. The car park behind the church soon gets full, but some on-street parking is available, and there is plenty of space in the parking area at the junction with Park Road and in the car park at Rosyth railway station. Or you might prefer to come by public transport, as the Church is on several bus routes, and less than five minutes walk away from Rosyth railway station. You can plan your journey at Traveline Scotland. The performance is expected to end at 9.00pm. There will be a 15–20 minute interval, during which refreshments will be available, for which donations are invited. The interval will also give you an opportunity to buy CD recordings of the Voskresenije Choir.